Increase your playing skills and get a great experience in game, using this new addon. 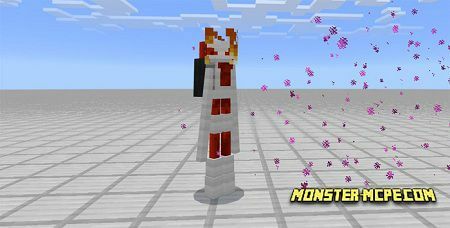 New twenty-three redstone mobs for MCPE. It is totally extreme addon with additional functional mobs. Details description below. Observer robot: help you in danger situations. His additional opportunity is, to explode before he will die. As soon as you will see how it begins to shaking, start to run away from him, he will explode. Flying chair: comfortable device for flying. All you need to control this item is to click on jump button when you on the chair and then move in direction you need. Similar as a riding on the horse, click jump for flying. Hopper: looks like a lawn mower. This machine pick up all items from the ground, automatically and save it. Take it on a leash. 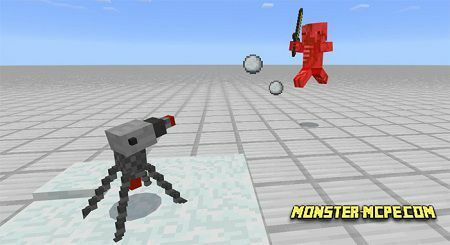 Destroyer (redstone): very dangerous in case if he will detect you, it is enemy mob, shoot snowball at its enemies. 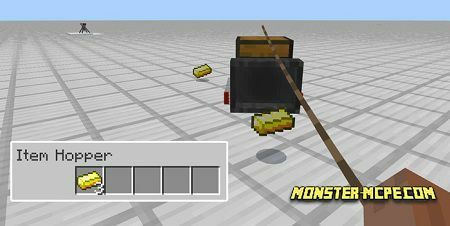 Motor (redstone): type of technical device for movement on the ground. Use redstone for increasing speed. 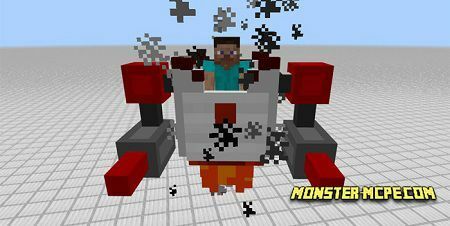 With using these items: diamond, sword or redstone, help you to control this vehicle. Will explode if it will die. 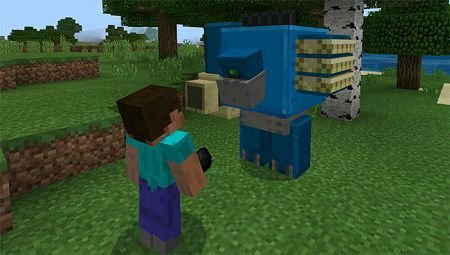 Dropper robot: mob gives' dropper block for dispenser robot. As it was mentioned before, dropper robot is dangerous for player, that is why, it will be not so easy to get it. Trade treasure things (in case if you will get it). You should use redstone if you need to receive useful items. Golden destroyer (redstone): same mob, as previous destroyer, but much stronger and instead of snowball he shoots by fireballs. Dispenser robot: shoot using 3 different kinds of projectiles for players, except monsters (snowball, arrow or fireball). Make it into tnt block, use flint and steel in order to ignite it. Necro circuit: you can find this mob in the Nether, but be attentive, he fly and searching for you. Do not underestimate this mob, its very dangerous, strong, and shoots at his enemies three fireballs in one time. dangerous for players, powerful fireballs. Turret (redstone): you should place it where aggressive mobs will no have opportunity to get to it, very weak. This turret will protect, firing in your enemies of snowball and arrow. Protector bot: it is quite the most useful robot for player. Protects from dangerous robots and monsters. Can ride you in air and on the ground. for player- it is friendly. Mega auto scorpion: very rare mob, modified version of scorpion, very danger boss. Flyborg: Dangerous machine for player. Very aggressive mob. Auto scorpion: beware the tail, can attack you and poison, which will attacks you for five seconds. shockwaves — poison during five seconds. PyroBorg: They are searching for lost player in order to kill. They spawn in the Deserts of MCPE. Robot workbench: You can use this robot in order to create another robots. Kinotone / momotone: These robots is similar to the guardians, all in what they have difference is health, model and texture. 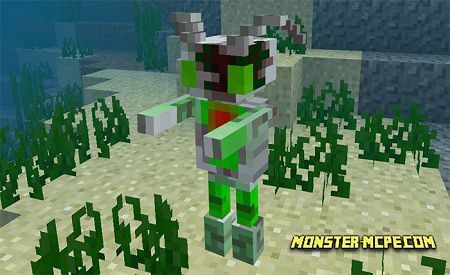 Sea destroyer: can find him underwater, it looks like rusty destroyer. Dangerous for players. V mechanic: type of boss robot. In order to kill him, you should have protector robot. Redstone sword: the best weapon against robot. windows 10 — right click on screen; press the electric power button. Redstone staff: Has the same functions as trident. Instead, trident. 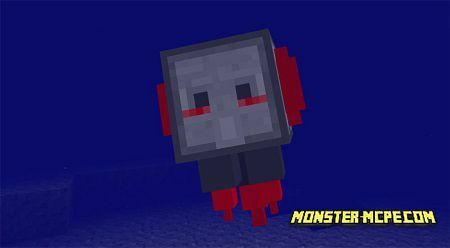 Octobomb: Floating mob which can explode if hit him. If you will hit him, he will explode.